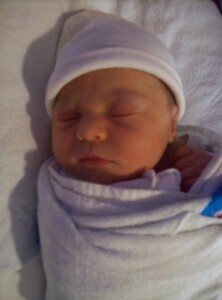 Iris Reilly Mitchell was born on March 17, 2012 at 2:11pm. It was a Saturday, about 80 degrees, and I’m told that flowers were blooming and people were celebrating in the streets. Maaaaaaybe that’s because it was Saint Patrick’s Day, but let’s just say it was also to honor my daughter. She is, after all, the newest member of the Grand Rapids American Irish community, and will probably have the coolest 21st birthday ever. After 30 some hours of labor, 17 of them being the trial of my life, she is well worth it. This may be my last post for a while… I think things are going to be a little busy. See you when I resurface! She is beautiful and I just love her. I hope that someday, you know when you have a free minute, you will right her whole birth story. I am such a sucker for a good birth story. Oh, I think sharing the day will be fun for her. Should help her form a sense of place. I gather that’s very important up there.